Conservation action is absolutely reliant on information about the distribution and abundance of butterflies. Butterfly Conservation uses a number of survey techniques to gather this information. This nationwide survey continues in 2016. There is growing acknowledgement of the importance of biodiversity in the wider countryside. Butterfly populations are an excellent way to monitor the health of an environment. UK butterfly monitoring in the past has concentrated on nature reserves and butterfly-rich places. This has led to a lack of monitoring in vast areas of the wider countryside. These areas include farmland, plantation woodland, uplands and urban green spaces. The UK Butterfly Monitoring Scheme, run by Butterfly Conservation and the Centre for Ecology and Hydrology, has in recent years developed the Wider Countryside Butterfly Survey (WCBS) method to gauge the changing abundance of widespread species in the general countryside. 70% of the UK’s land is in agricultural use. It is essential that butterflies in these areas are monitored to gauge the health our countryside. Over 600 dedicated volunteers surveyed more than 760 squares as part of the nationwide WCBS launch in 2009. The WCBS benefits from an excellent partnership with the British Trust for Ornithology Breeding Bird Survey recorders. The WCBS involves volunteers carrying out surveys in 1km grid squares which have been picked out randomly and so are representative of the whole country. 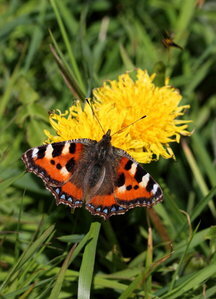 Participants are asked to record all the butterflies at their site on at least two occasions during the summer. Detailed instructions of what is a simple survey technique are given out to all participants. The 60 or so random squares allocated to the branch are shown on the map. There is a fair sprinkling across the branch of squares with green markers indicating that they need someone to record that square. If you click on a site marker you will see further details of the site, including a link to a web page showing its location on an OS Map. This survey is already giving interesting results - you can read the latest annual report on progress. Of course, as with all survey work, data from a long period will be needed before firm conclusions can be reached on trends in abundance, so if you would like to take part in this ground-breaking survey, then please contact Richard Buckland as soon as possible (tel: 0131 332 0615 ). Visit the UKBMS website for more details and copies of instructions and recording forms. 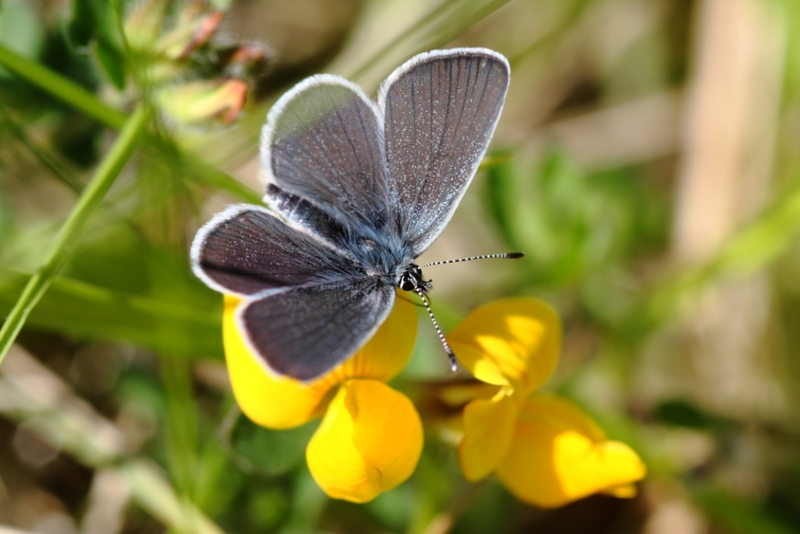 During 2014 the Small Blue butterfly continues to be an important focus of survey and conservation work for the branch, with activities based mainly in coastal areas. This is a priority species in the UK Biodiversity Action Plan which has suffered a significant contraction in range over recent decades. Looking back in time it once had colonies in many places on the Scottish coast; all of those on the west have been lost, together with a good number on the east. A project to reintroduce the Small Blue is currently underway at Gailes Marsh in Ayrshire and adult butterflies were released there in 2013. Initially projects were centred on the Angus and Berwickshire coasts, and in 2013 work started in Moray and Aberdeenshire. A lot of progress was made with surveys during 2012 and 2013, when both the butterfly and its sole larval foodplant Kidney Vetch were searched for. While the Kidney Vetch was often found in abundance, sightings of butterflies were worryingly scarce, although periods of poor weather, particularly during 2012 would have interfered with both the butterfly flight period and the surveyors. Many of the findings to date are in reports which you can find on the Publications page. Along with BC East Scotland branch members there are many other groups who are contributing to these projects, including Tayside Biodiversity Partnership, Angus Council Ranger Service, NE Scotland Biodiversity Partnership, Scottish Wildlife Trust, National Trust for Scotland and the Berwick Wildlife Group, but we still need to recruit more volunteers to carry out the survey work during the period May to July. You don’t need to be an expert to help as guidance will be provided from the teams running the projects. Kidney Vetch is easy to identify when it’s in flower and the Small Blues are not an ID problem, but locating them often is. Opportunities to help the butterfly are being explored in the coastal areas where much apparently suitable habitat exists and also along some disused inland railway lines where the butterflies appear to be only just hanging on. Practical conservation measures such as scrub removal and planting more Kidney Vetch may be planned for some sites. This butterfly captures some important aspects of what Butterfly Conservation is all about. It lives in wild, uncultivated places, is often reluctant to stray far from its origin, can easily be overlooked, doesn’t come into gardens (so people just don’t see it much) and so it is threatened by changes to the countryside which may unwittingly destroy the habitats it needs. At the same time, there are real opportunities to raise awareness of this beautiful little butterfly and to reverse its decline through projects such as these. This butterfly is another UK Biodiversity Action Plan Priority Species and Eastern Scotland probably holds the majority of sites with colonies. Consequently survey work, site monitoring and conservation activities remain important. It appears to be holding its own in many areas but at a national level there has been a significant drop in numbers recorded at UK Butterfly Monitoring sites. Important areas for this species are Deeside, Western Perthshire, the Sidlaw Hills and much of the Borders and there are currently on-going surveys in many areas which you can help with by contacting the relevant Local Area Organiser (see Committee page for their details). It will help greatly if standardised survey forms are used to record your sightings and these are available for the Borders and for Tayside/Angus/Perthshire - they can always be amended to suit other parts of the country. The Pearl-bordered Fritillary is a high priority species. It is a UKBAP Priority Species and is included on the Scottish Biodiversity List. It has recently been designated a Species Action Framework Species by SNH. Although still relatively widespread in the UK, most colonies are small and vulnerable to changing management It has declined rapidly across the UK, particularly in England, and Scotland is now the major stronghold but we believe it is still under-recorded with many sites having few recent records, hence the need for this survey. Owing to the efforts of Butterfly Conservation staff and volunteers over the last 20 years, approximately 270 Pearl-bordered Fritillary sites have been identified in Scotland with the caveat that some could be the very similar Small Pearl-bordered Fritillary. However, many of these sites have not been visited in the last five years according to Butterfly Conservation Scotland's records, and some have not been visited for several decades. Therefore, these web pages which list the sites which have not been visited in the last five years (some sites have been included where a visit has been made in the last five years but Pearl-bordered Fritillary was not found) have been constructed to help direct volunteer effort to visit these sites in May 2009. The Mountain Ringlet (Erebia epiphron) is a rare UK butterfly being confined to montane habitat between 350 & 900 m in the central highlands from Ben Lomond in the south to Creag Meagaidh /Glen Roy in the north and from Glasdrum/Glencoe, Argyll in the west to Schiehallion in central Perthshire in the east with two known colonies further east in the Cairngorms National Park: Glen Doll & Glen Feshie. This distribution amounts to just 50 10 km squares in Scotland which makes it much rarer than the iconic birds of the Scottish mountains such as the Ptarmigan & the Golden Eagle. Given the presence of large areas of land from 350-900 m outside the known range, there must be a factor other than altitude which explains this limited distribution of Mountain Ringlet. This aspect of Mountain Ringlet ecology is being investigated as part of a research project into montane invertebrates being funded by Scottish Natural Heritage, the John Muir Trust, the National Trust for Scotland & Butterfly Conservation during 2008 & 2009. Previous research suggests that it is a combination of damp Mat-grass grassland and abundant nectaring plants which provides good habitat for Mountain Ringlet. The Butterfly Transect is a walk along a set route that is divided into separate sections. In each of these sections the number of butterflies are counted along with the climatic conditions. Using this method comparisons can be made year-on-year and between transects. The UK has over 1500 recorded sites going back a far as 1976. Scotland has a growing number of transects, many of which are located here in the East Scotland branch. The transect is an enjoyable way of getting to know a site well and all the butterflies in that site. A weekly commitment is usually required and usually groups of walkers share such a walk. The walk is done from April till September every year and the counts entered into free software called Transect Walker available from the UKBMS website. If you would like to know more about transects and how to set one up please contact or the Scottish Transect Co-ordinator: . Click a link below - you will be prompted for a location where you wish to save the file.